Jazmin Shelby was "born with clenched fists"-which is okay, since she's got a lot of fighting ahead of her. Her dad died a couple of years back, and now that her mom's in the hospital, it's just her and her big sister, CeCe. But that's fine by Jazmin. She's got her friends, her school, lots of big plans for the future-and a zest for life and laughter that's impossible to resist. Nikki Grimes is the award-winning, New York Times bestselling author of dozens of children’s and young adult books as well as a poet and journalist. Among the many accolades she has received are the Golden Dolphin Award (2005),the NCTE Award for Excellence in Poetry for Children (2006), the Coretta Scott King Award (2003) for Bronx Masquerade, and the Horace Mann Upstanders Award (2011) for Almost Zero: A Dyamonde Daniel Book. Additionally, her book Barack Obama: Son of Promise, Child of Hope (illustrated by Bryan Collier) was a New York Times bestseller, and she was acknowledged as an NAACP Image Award Finalist in 1993 for her book Malcolm X: a Force for Change. 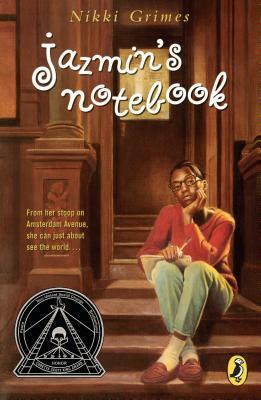 Her books Meet Danitra Brown (illustrated by Floyd Cooper), Jazmin's Notebook, Talkin' About Bessie (illustrated by E.B. Lewis), Dark Sons, The Road to Paris, and Words with Wings were each awarded Coretta Scott King Honors. Visit her online at www.nikkigrimes.com.